Da Capo Press, 9780306811265, 352pp. 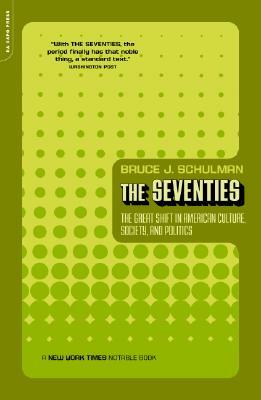 Sweeping away misconceptions about the "Me Decade," Bruce Schulman offers a fast-paced, wide-ranging, and brilliant examination of the political, cultural, social, and religious upheavals of the 1970s. Arguing that it was one of the most important of the postwar twentieth-century decades, despite its reputation as an eminently forgettable period, Schulman reconstructs public events and private lives, high culture and low, analyzing not only presidential politics and national policy but also the broader social and cultural experiences that transformed American life. Here are the names, faces, and movements that gave birth to the world we now live in-from Nixon and Carter to The Godfather and the Ramones; from Billie Jean King and Phyllis Schlafly to NOW and the ERA; from the Energy Crisis to Roe v. Wade. The Seventies is an astutely provocative reexamination of a misunderstood era. Bruce J. Schulman is the William E. Huntington Professor at Boston University and Chair of the History Department at Boston University. The author of three books and editor of two, he has been a contributor to the New York Times, the Washington Post, the Los Angeles Times, and has appeared as an expert commentator on many television and radio programs. He lives in Massachusetts.